THIS is what happens when you accidentally throw a couple of yards of sock yarn into the washer and dryer. 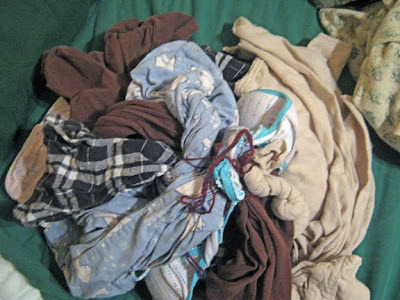 A tangled mess of one linen shirt, one bra, and three pairs of flannel pajama bottoms. Surgery was needed, all clothing survived, although with interesting twisty patterns dried in. Just one more reason why crocheters and knitters need to check their pockets before laundry day! This is the new Crochet Christmas Gift Card Holders set, available at Patternfish.com. The $3 pattern includes the mini-stocking, Santa's mitten, ornament, and my personal favorite, the peppermint stick. Make one up quickly to add a little happy to a gift of a gift card or cash. Have you seen the Beaded Thistle Shawl? It's crocheted in a lightweight acrylic/mohair blend called Swiss Mohair, which will be available to the world in January of 2010. Can't wait? Try my kit! The kit includes the pattern, one skein (600 yards) of the yarn in one of your choice of six colors, glass beads with an aurora borealis/pale pink finish, and a #10 steel hook with which to attach the beads as you crochet, because hell hath no fury like trying to string a skillion beads on mohair yarn! 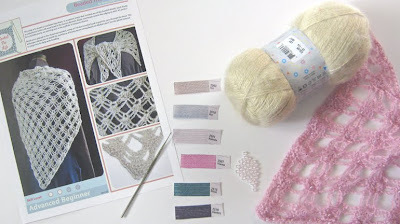 There is even a nice little beading photo tutorial on the back of the pattern! All this for $19.99 plus $5.50 shipping and handling in the US - out of US residents need to hit me with an email for shipping rates. The full details are here - all six colors are currently in stock, but may not be for long. 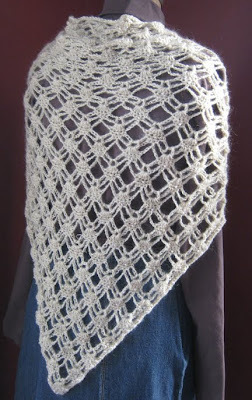 First off, a gift to you from NaturallyCaron.com - my newest knitted shawl pattern. It's available as a free download here - enjoy! It starts at the center of the upper edge and grows as you stitch, so you can adjust the length/width to your desired dimensions - or call it a mini-shawl if you run out of time before the holidays, run out of yarn, or simply get bored! So I am doing my annual crazy person routine - deadlines, the holidays, trying to get new things out and ready for TNNA which has the nerve to be in early January every year. It's like Christmas - I know it's coming, I know I have a ton to do, but I never seem to get it all done in a timely fashion. Add in the new kits I am working on (photos soon) and all the every day stuff, and it's crazy. Which I know I say a lot. But it is. Anyway, I was out running errands the other day and came home to find my neighbor/buddy/fellow yarn addict plopped on my living room floor, playing with the dog. This is a good thing. I apologize for being rushed and am chatting with her as I fly through to the dining room, where the laptop was sitting, so I can check for an email I am waiting for. Since she is sitting on the floor, she points and laughs at my mis-matched feet. Yes, I reply, I know my socks don't match, but I am so crazed I haven't had time to do laundry and at least they are both clean, which I thought was more important...blah blah blah on my part. She is still laughing. And pointing. So I look down and see that MY SHOES DON'T MATCH EITHER! Seriously, I went out of the house and ran errands for two hours with two different shoes on AND DID NOT NOTICE! At least they were both black.